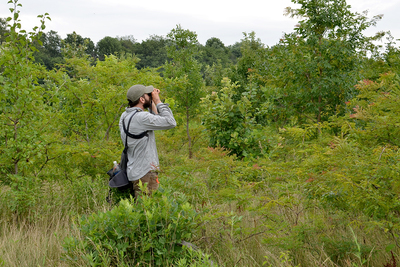 Illinois Natural History Survey avian ecologist Bryan Reiley looks for rare birds on conservation lands. Illinois Natural History Survey avian ecologist Bryan Reiley studies birds that make use of private land in the Conservation Reserve Enhancement Program. 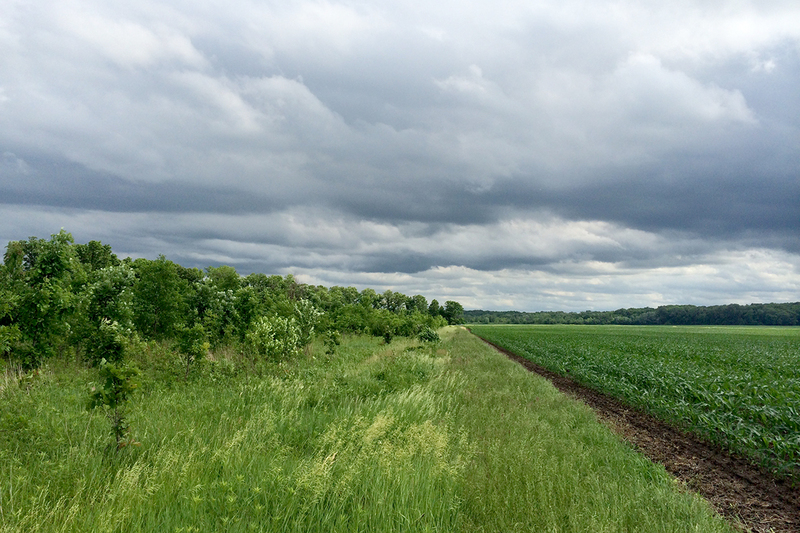 NEAR CANTON, Ill. – I’m soaking wet from head to toe after walking through a mile of head-high dew-covered grass. Finally, I make it to my destination: an overgrown field dotted with copses of shrubs next to the Spoon River in western Illinois. I take the caps off of my binoculars. I’ve got my clipboard, a new data sheet and the stopwatch app on my phone ready to go. For the next 10 minutes, I will make a note of every bird I see or hear (mostly hear), recording its species and estimating how far away from me it is. 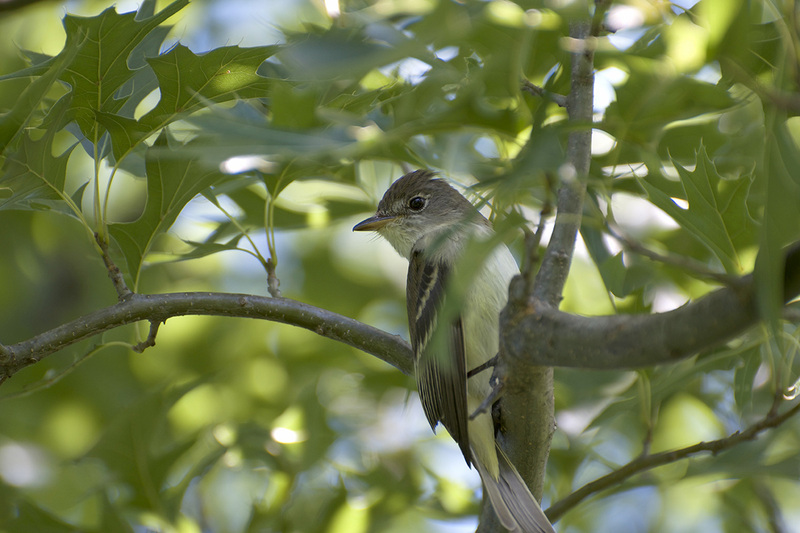 A Bell’s vireo guards its nest. 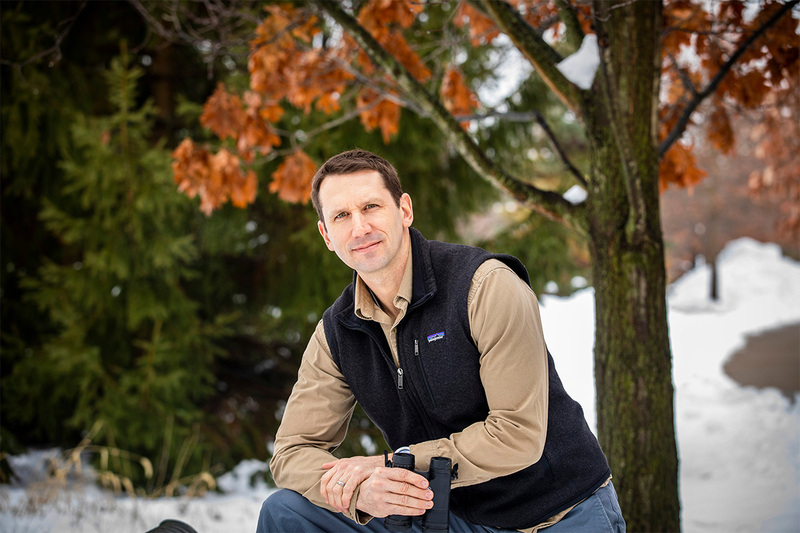 I’m standing on private land, a former agricultural field now enrolled in the Conservation Reserve Enhancement Program, which pays farmers who voluntarily enroll to remove poor-quality cropland from production and restore wildlife habitat on their land. 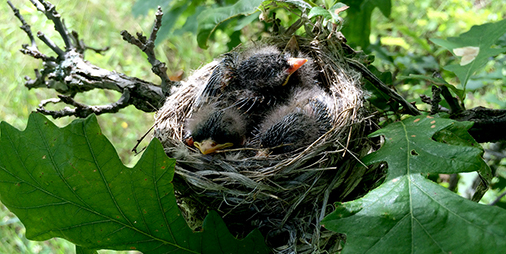 Since its inception in 1996, the program has created more than 200,000 acres of wildlife habitat in Illinois. 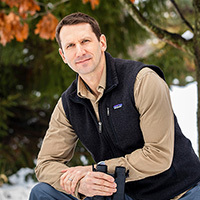 My task is to survey randomly chosen fields in the program to figure out whether and how these conservation areas are affecting birds that have declined in numbers over the decades. 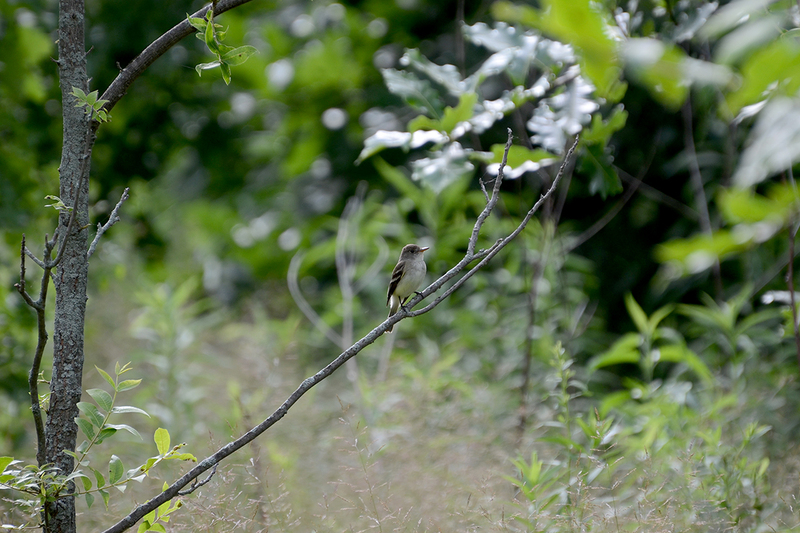 Among other things, I’m interested in understanding if the size of a restored field or the amount of restored habitat in the surrounding landscape influences these bird populations. By asking these questions, I hope to learn how to improve the management of these fields in the future. 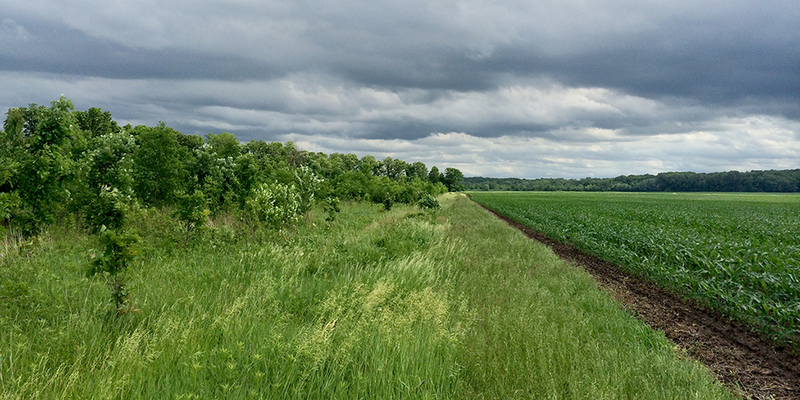 Conservation Reserve Enhancement Program lands adjacent to active farmlands support birds and other wildlife. I start the stopwatch and the survey begins. Suddenly, I see a mob of red-winged blackbirds who have nests in the tall grass in a wetland nearby. After I count them, I try to tune out their endless racket. I’m listening for some of the rarer species. 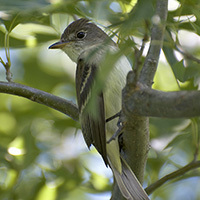 A willow flycatcher in western Illinois. In the course of the survey, I see or hear a few of them. 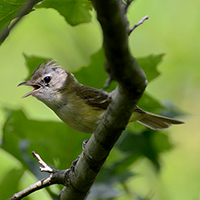 There’s a Bell’s vireo, with its gravelly trill near a shrubby patch to the south. A little later, I catch sight of a group of dickcissels in an expanse of grass to the east. Two field sparrows catch my eye as they dart around looking for nesting material. 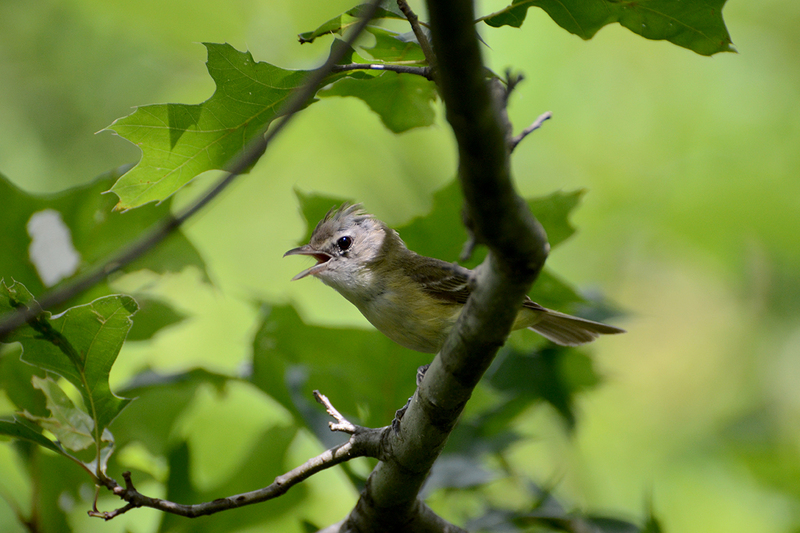 A Bell’s vireo scolds a trespassing scientist. 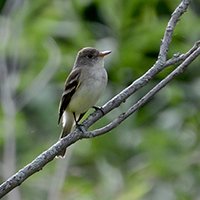 I look in vain for the willow flycatcher, a small gray bird whose song sounds like: “fitz-bew,” and the yellow-billed cuckoo, who calls: “ka-ka-ka-ka-kow-kow-kow-kow-kow-kowlp-kowlp-kowlp-kowlp.” All these species have declined precipitously in the past 60 years. Hearing and seeing any of these rare birds makes me happy. 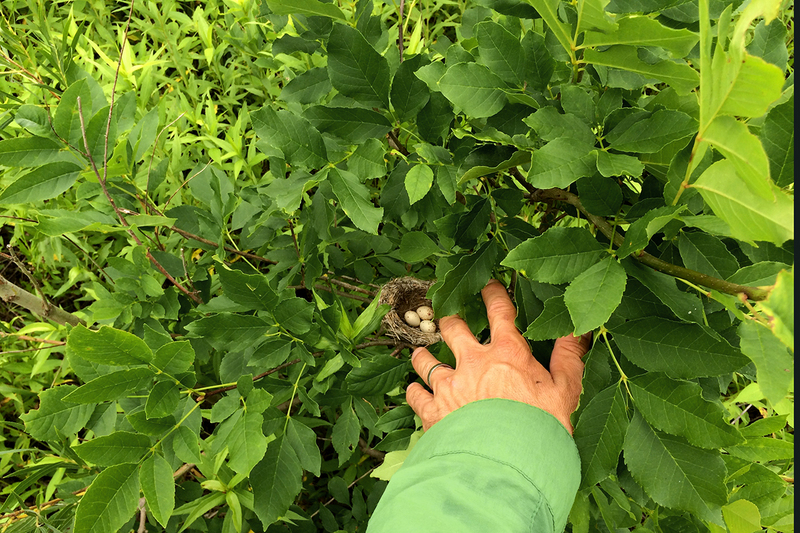 Reiley discovers a Bell’s vireo nest on conservation lands. Now, I’ve got to bushwhack the same wet grassy mile back to the car and drive to the six other sites I want to survey this morning. 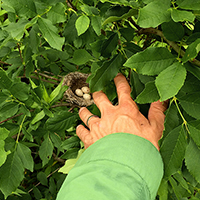 This afternoon, I’ll visit a few of the 14 fields I have chosen to monitor and look for Bell’s vireo and willow flycatcher nests. If I’m lucky, somewhere along the way I’ll even have time for lunch. 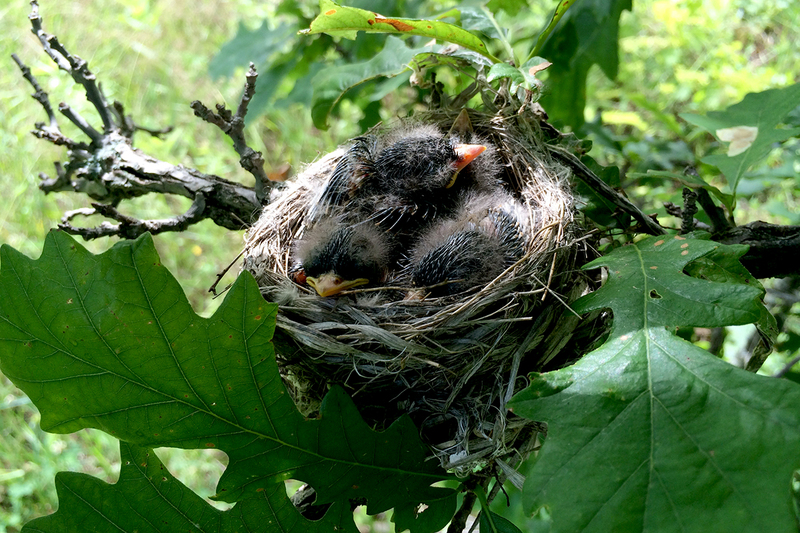 These willow flycatcher nestlings huddle down to await their next meal.